Even the world's largest tech conference is feeling the effects of the U.S. government shutdown. Organizers of the CES gadget show said Saturday that some scheduled government speakers have canceled their travel plans. 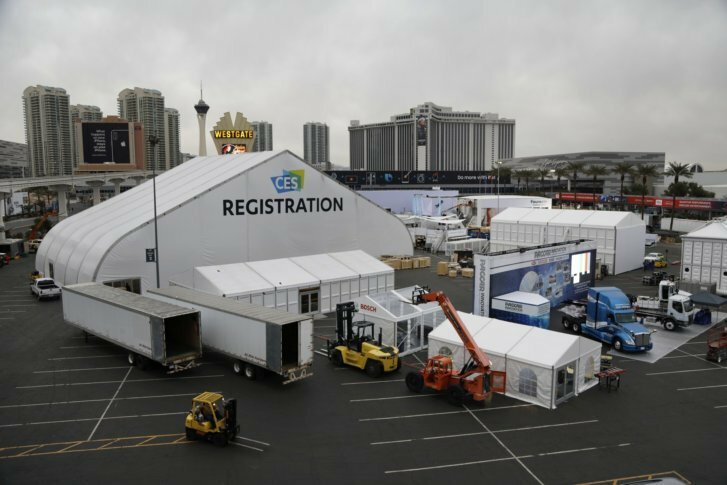 LAS VEGAS (AP) — The CES 2019 gadget show is revving up in Las Vegas. Here are the latest findings and observations from Associated Press reporters on the ground as technology’s biggest trade event gets underway. What gadgets will Americans buy this year? Lots of “smart” devices for their home, according to projections from a technology association. If that sounds a lot like last year, you’re right, but sales are still expected to grow again in 2019. The Consumer Technology Association expects nearly 37 million Amazon Echoes, Google Homes and other smart speakers to be sold this year in the U.S., a 5 percent increase from a year ago. Meanwhile, more than 29 million smart doorbells, thermostats and switches are expected to be sold, a 23 percent increase from the previous year. The numbers were released Sunday, two days before the CES 2019 gadget show opens to attendees in Las Vegas. CTA runs the show, which is technology’s largest trade gathering. The group warned that its projections could change significantly if a trade war with China escalates. Much of the world’s electronics are assembled in China, and the CTA has said that steeper tariffs could hurt the industry by making smartphones or TVs more expensive for consumers. Other gadgets expected to sell well in 2019: wireless earbuds, smartwatches and drones. Fewer TVs are expected to be sold, however — 42 million units, a one percent decline from 2018. Total U.S. tech revenue, which includes video and music streaming services like Spotify, is expected to rise 3.9 percent to a record $398 billion this year, the CTA said. Ready for a smartphone-like touchscreen on your car’s steering wheel? That’s the future according to Chinese electric carmaker Byton, which is planning to sell its first vehicles in China this year and in the U.S. in 2020. Byton CEO Carsten Breitfeld unveiled the new driver interface system Sunday at the CES 2019 gadget show in Las Vegas. He says the wheel-mounted touchscreen on the company’s first model, called the M-Byte, “will stand still while the steering wheel rotates.” The crossover SUV also features a long digital screen across its dashboard. Byton executives say they’ve met with legal authorities in various countries to ensure the entertainment and control system meets safety standards. They say it’s safer than dashboard touchscreens because the wheel’s already in a driver’s field of vision. Even the world’s largest tech conference is feeling the effects of the U.S. government shutdown. Organizers of the CES gadget show said Saturday that some scheduled government speakers have canceled their travel plans. The sprawling consumer-electronics show opens to attendees on Tuesday in Las Vegas. Canceled speakers include Federal Communications Commission Chairman Ajit Pai and at least nine other officials from agencies including the Federal Trade Commission, the Environmental Protection Agency, the Food and Drug Administration and the Department of Homeland Security. CES organizers say Transportation Secretary Elaine Chao is still planning to deliver a keynote talk Wednesday on federal initiatives to advance drone technology and self-driving vehicles. Apple stopped attending the CES consumer-electronics show years ago, but it’s still making its presence known. The biggest may be the huge sign it splashed across a high-rise hotel overlooking the Las Vegas conference center where other tech companies are gathering to show their wares this week. The sign says, “What happens on your iPhone, stays on your iPhone.” It’s a not-so-subtle dig at the looser privacy practices of data-hungry rivals like Google and Amazon. But Apple also has news to share at CES. It’s just letting some of its partners do the talking. AP reporters Matt O’Brien and Joseph Pisani contributed to this article.